The Weider PRO 5500 Multi Gym is designed with home users in mind who seek a versatile machine for safe, comfortable and effective workouts. The multi gym has a weight stack of 85kg (187.4lbs) and can withstand the maximum user weight of 150kg (330.7lbs). 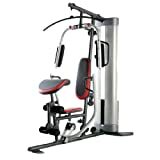 It is equipped with a butterfly station with padded horizontal butterfly arms, an arm press, high and low pulley stations as well as a leg developer with padded, 4-foam station that isolates quads and hamstrings for leg extensions and curls. A comfortable workout position has been ensured by an adjustable seat and preacher pad, while an ankle strap helps you get the most of the pulleys.